Hi friends! I'm back again today with another little Valentine's post before the day's gone. These little creations are going to some very special people, so before I send them off, I thought I'd share them with you. 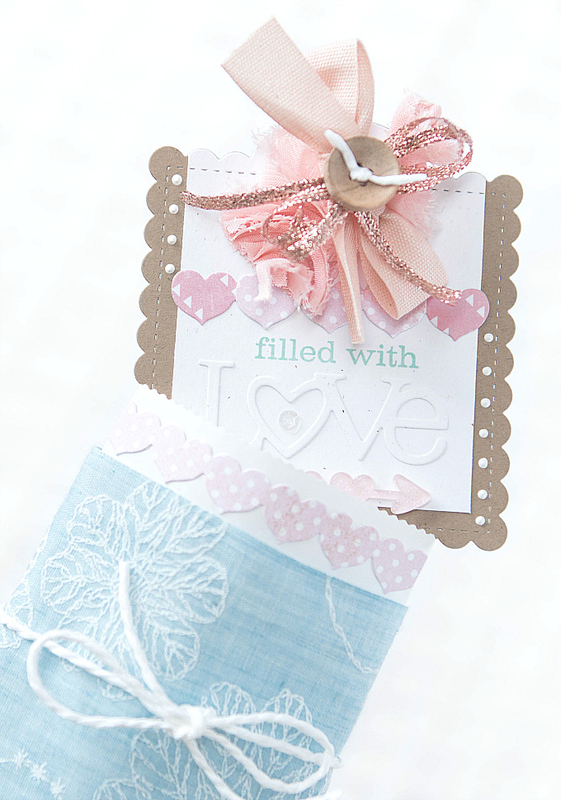 First up, I made a few of these little tags to tuck into goodie bags and to add to some yummy baked treats. I wanted to make something that was simple and easy to duplicate, but still looked elegant and detailed. 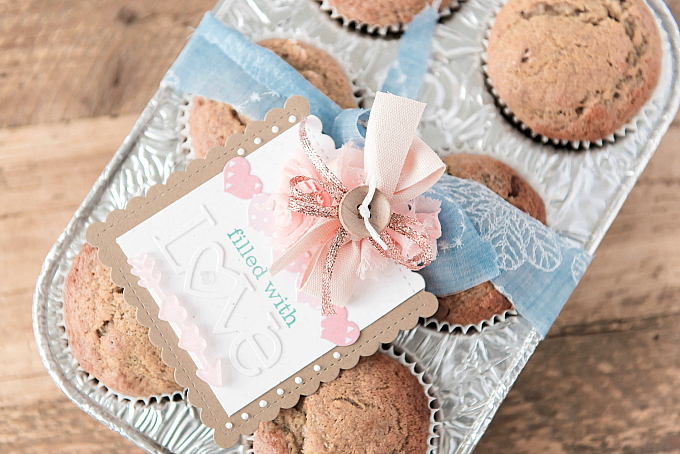 So I used a simple design, and then embellished each tag with a pile of fancy bows. I picked up most of the ribbons in the sweetest little shoppe you can imagine, right here in our city. 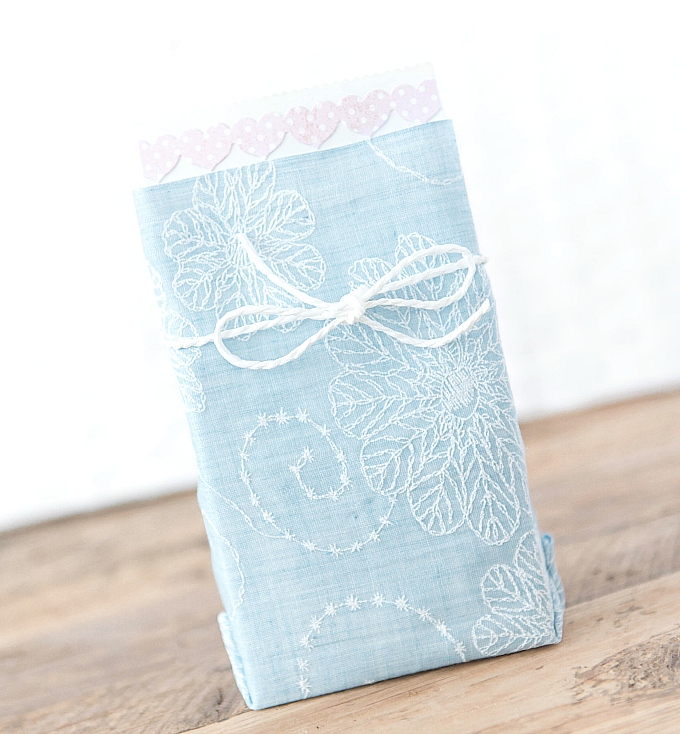 We are so fortunate to have such a lovely, local place to find beautiful goodies. If you're ever visiting us here in Saskatoon, be sure to check out Soul Paper. And these honestly couldn't have been any simpler to make. Just a touch of hot glue on either side of the fabric, and a little bit of glue to hold the side flaps in place, and voila! The most challenging part was measuring the fabric so that it would comfortably fit an open bag. To make it a bit easier, I filled a bag with rice to help me get an idea of how big it would be open, and then roughly measured out the pattern. The fabric is a little loose, but it still works wonderfully! I added a little bit of string and a Heart Border to the top, using some sweet polka dot printed paper. To create the little tag, I started out with Papertrey Ink's Tag Sale: Quilted die, die cut in both kraft and white cardstock. I trimmed the white portion just a tad on three sides so that I could layer the two pieces together. 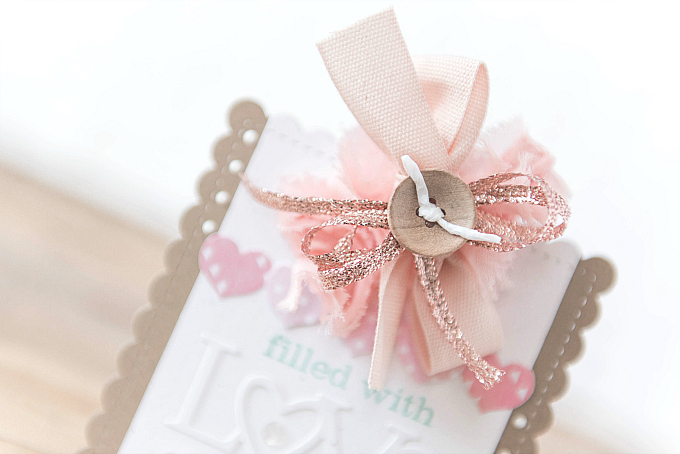 At the top of each tag, I added a trio of ribbons, a peach twill, soft bloomer ribbon, and a lovely metallic rose gold. I love this combo! I added a wood button with some string to the center of the cluster. Just below that I added another little heart border, along with a stamped and die-cut sentiment using the Wonderful Words: Love stamp set and dies from Papertrey Ink. The next little creation was made for a very special and dear couple that we recently had the pleasure of meeting. I have long been so grateful to blogging in that it has afforded me the opportunity to meet wonderful, kind, and talented people from all over the world. But I never imagined that it could be more than that. When first I met my dear friend Aneta through this blog, I had no idea what our friendship would blossom into, but I knew that we instantly clicked. Over the years, our friendship grew and we always had the wish to finally meet in person one day. I adore this little viking and thought it couldn't be more perfect for them! And then I saw the little saying, and became doubly smitten! 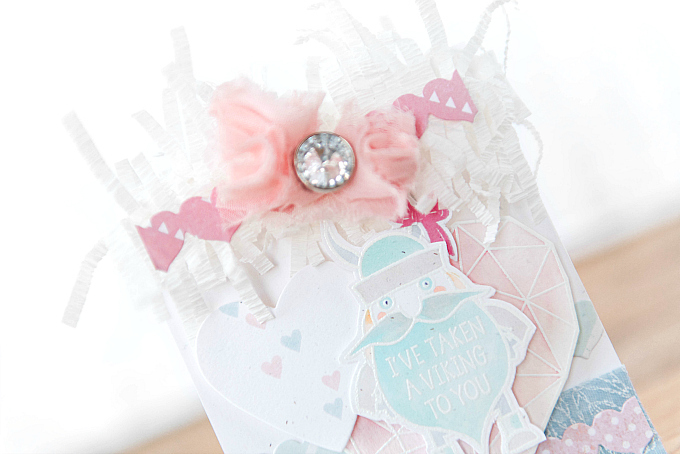 To start this little card, I used Copic markers to color in the little viking from Avery Elle's I've Taken a Viking to You stamp set, which I stamped and embossed in white. I then used my scissors to fussy cut his adorable self. I also stamped and embossed a sweet little heart using Neat and Tangled Heart of Gold stamp set, and then watercolored it with soft shades of pink. On the top of the card, I used a bit of scrunched up crepe paper, PTI's Heart Border, and some bloomer ribbon with a rhinestone. Just below that, I added a bit of fabric, some more Heart Borders, and layered all the pieces together. 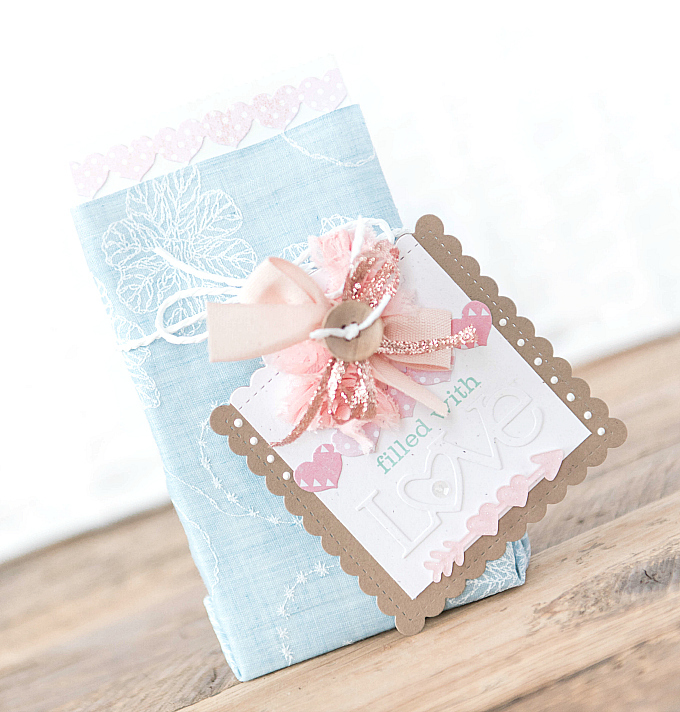 I added another little heart, cut using PTI's Heart Prints die, stamped with itty bitty hearts in shades of Sweet Blush and Spring Rain. 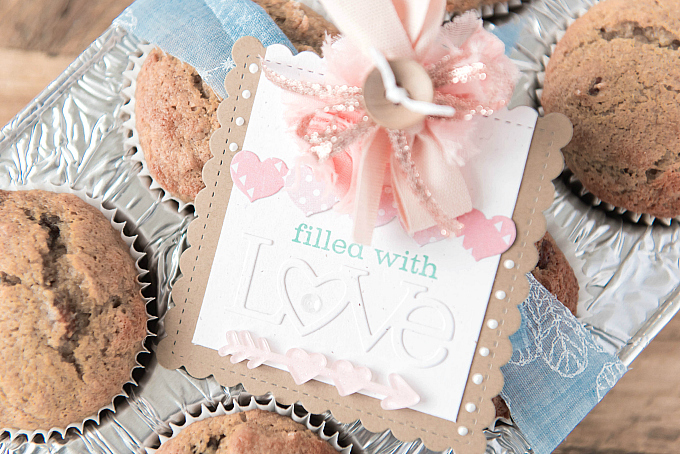 And before I go, just another take on the wee tags - used here with some yummy baked goods. I think we may have found a new favorite Banana muffin recipe, which you can find here. It's a wonderful base, and we altered it slightly so I'm sharing the adjustments just in case you're in need of a good recipe. Hope you'll give it a try! My hubby says they're absolutely delicious! This is so pretty!! 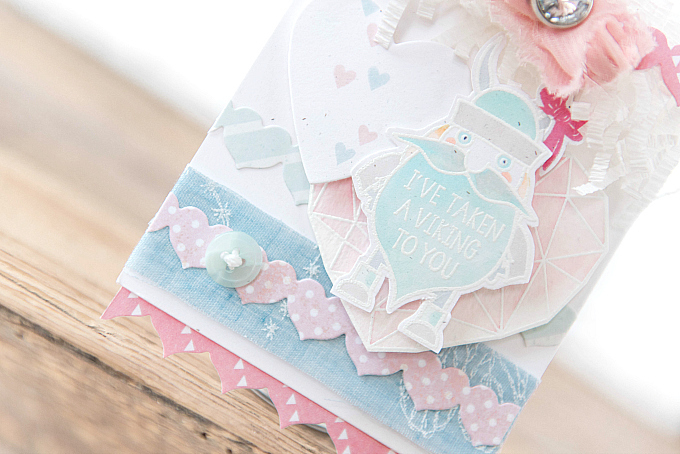 I love your color choices and the adorable way you layered everything!! Love the viking. Puns make me smile...and groan a little! lol Everything you do is so precious. They do have that effect, don't they? :) Thanks so much for the sweet comment - I appreciate it so much! !